The craze for animal furniture came from the work of Rowland Ward, who was a talented taxidermist whose work popularized the trend. The Strand Magazine/Babel.HathitrustA tiger chair, a bear dumb waiter, and a baby giraffe chair. When you see a baby elephant, you might think, “Oh, how cute.” But if you were a Victorian, there’s a good chance you would have thought, “Hmm, you know, that would make a great umbrella stand.” That’s because, for a brief time, it was extremely fashionable to make furniture out of exotic animals. 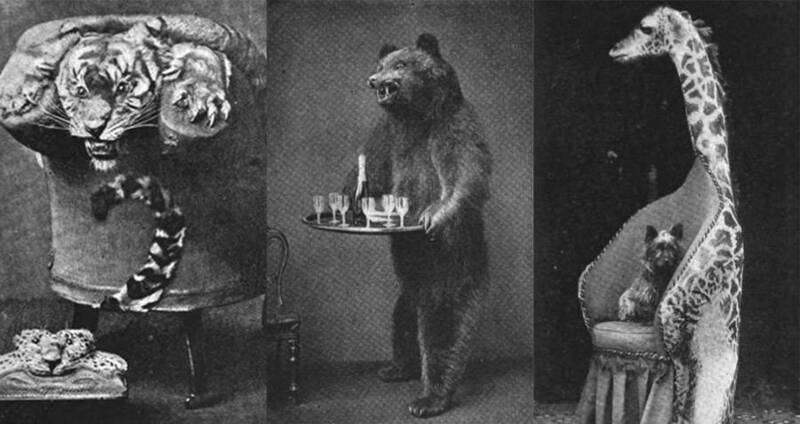 Bears were taxidermied, propped up, and used to hold drinks. Tigers were turned into chairs, complete with a menacing looking head. And elephants were turned into footstools, containers, and yes, umbrella stands. The whole thing was certainly kind of weird. But you sort of have to marvel at the sheer effort and ingenuity the Victorians put into turning animals into insanely gaudy furniture. For instance, you really have to wonder how anyone thought it was tasteful to turn an entire emu into a lamp. Or why someone would turn a monkey into a candle holder, the candles propped up in its little hands. Both of those things existed by the way. In 1896, a British magazine, The Strand, published an article detailing some of the most “creative” forms of animal furniture. Included was an impressive photospread to help give their readers some idea of what was in style at the time. Those included relatively tame arrangments, like a chandelier made from antlers. But it also included a giraffe turned into an easy chair, a lamp with a dead monkey climbing it like a tree, and some sort of unholy monstrosity of a throne surrounded by dead bison, deer, and gazelle. A lot of the craze for animal furniture came from the work of Rowland Ward, who was a talented taxidermist whose work popularized the trend. As a result, this type of furniture came to be known as “Wardian Furniture.” But in a broader sense, there was a lot more at play than people just deciding that animal furniture looked cool. At the time, Britain was near the height of its colonial power. British-controlled territories stretched from North America to Asia. And the British were proud of their empire and all the exotic places they held sway over. Novels describing what life was like in these places and the animals that dwelled there were very popular. Nothing gave the impression that you were a wealthy member of the colonial elite like taking trips to shoot those animals. Having a dead elephant in your home was a sign that you weren’t just a citizen of a colonial power, you were helping to spread its influence over the world. It was a sign that you were rich enough to go hunt in far-off places like India. So, for one brief moment in history, colonialism and a passion for hunting trophies combined into a bizarre trend to turn dead animals into furniture. But while it seems strange today, it didn’t then. And of course, that makes you wonder if someday, some of the things we’re crazy about today might seem just as strange. Next, read about the world’s deadliest animals you don’t know about. Then read about the world’s six most bizarre animals.